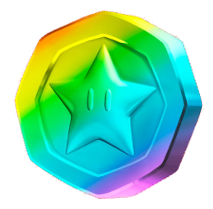 A rainbow-colored medal with a star imprinted on it. Bonus Medals are flashing, rainbow-colored Star Medals found in Remix 10 mode of Super Mario Run. Three Bonus Medals are found in each course, except in Special Remix Courses (marked with a big !) and Secret Courses (marked with a big ? ), where there are five. Due to the short length of the courses, Bonus Medals are often found grouped together, although they are more spaced apart in some cases. If the player collects all Bonus Medals in a course, they receive a "Perfect!" result. Collecting Bonus Medals fills up the gauge for the Bonus ? Block, which can unlock rare objects for Kingdom Builder. Once it is full, the gauge resets and the player is then able to use one Bonus ? Block. The player also receives extra Bonus Medals for reaching a certain milestone in Remix 10 or achieving a "Perfect!" for every course in a single 10-course interval. Occasionally, after an interval, an icon of a Bonus Medal on a cloud may appear on one of the courses on the map screen for 15 minutes. If the player reaches this course before it disappears, they enter a short bonus course containing many coins and five Bonus Medals. On rare occasions, when the player reaches this course, the icon will begin to sparkle. When this happens, every coin within the course will be turned into a Bonus Medal, allowing the player to obtain a large amount of Bonus Medals. Bonus medals look very similar to Star Coins, with the only difference being their color. This page was last edited on March 29, 2019, at 07:28.